My name is Prajit Nanu. 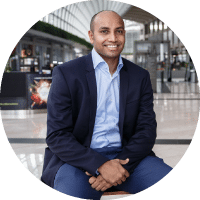 I am Co-founder and CEO at InstaReM, Asia-Pacific’s leading digital cross-border payments company, where we help individuals, SMEs and financial institutions to transfer money globally conveniently, quickly and cheaply. At InstaReM, I am responsible for executing the business strategy and directing the overall performance and growth of our organization. As well as being in charge of driving innovation across processes and create value-add for customers. Prior to co-founding InstaReM, I held several leadership positions in global companies, including Global Sales Director, TMF Group and Vice President, Sales and Account Management at WNS. The most important requirement to become an expert in any field is passion, genuine desire to contribute to the society, and make a difference. Interestingly, I had nothing to do with international money transfers for most of my 10+ years career as a sales and consulting professional in India. An accidental personal experience got me thinking about a problem that was so huge and so universal. Here’s what happened. I was trying to organise a bachelor party at a resort in Phuket for a friend. With some Google search, I picked a terrific spot, and needed to send INR 40,000 (US$640) to book the resort. The resort asked me to send money to their account as a bank-to-bank transfer. I didn’t think too much about it, till my bank asked for extensive documentation to transfer a not-so-huge amount. Arranging all the documents would have taken a lot of time and effort. Luckily, I found an Indian friend based in Thailand, transferred the money to his bank account in India, and he paid it to the resort in Thai Baht. Later, the friend revealed that he had been sending money to India every month and his bank was charging a small fortune for the service and was taking a FX spread – the difference between the inter-bank currency conversion rate and the rate quoted by the bank or money transfer company – as well. This was my first glimpse into the problem, which was so real and universal. This incidence got me thinking about how I could convert this problem to a successful business. I spent a lot of time thinking how I can scale this concept. Michael Bermingham, the other co-founder, who shares my vision, was the first person I called in London when I strongly felt a need for a convenient, transparent and affordable digital funds transfer platform. After tonnes of in-depth research and identifying a better way to move money across borders, we got started on a technology-based solution. We started working together in 2013 to combine Michael’s expertise in Compliance and my experience in Sales & Consulting, to incorporate InstaReM in August 2014 in Singapore. WHAT AREAS OF INTERNATIONAL MONEY TRANSFERS ARE YOU MOST PASSIONATE ABOUT? I strongly believe that remitting money back home must not be so expensive for the people who migrate overseas in search of better quality of life for themselves and families. We are building an international money transfer business by disrupting traditional players with application of financial technologies and we are fairly successful in making a mark for ourselves. However, no business can be successful if you cannot give your customer a great experience. We, at InstaReM, work round-the-clock to ensure we delight our customer with great service – every time. These are some of the aspects around which InstaReM’s business has been built. WHICH INTERNATIONAL MONEY TRANSFERS INFLUENCERS INFLUENCE YOU? Dilip Ratha, Head of the Global Knowledge Partnership on Migration and Development, or KNOMAD, World Bank, has the strongest influence on me in the International Money Transfers space. Everyone I know in remittances has mentioned to me that they got into remittances because they either saw Dilip Ratha’s TED video or read his publication. I think he is one of the most influential individuals on global remittances today. I had the privilege to meet Dilip at Money 2020 and was amazed at his passion and thinking around reducing cost of remittances. Interacting with him makes me feel more energised in solving the remittance problem. Dilip is the one who inspires me and drives me to do more. OUTSIDE OF INTERNATIONAL MONEY TRANSFERS WHO ELSE INFLUENCES YOU? I get influenced and inspired by people – living, gone and sometimes even fictional ones – as well as things around me. The story of Amazon founder Jeff Bezos inspires me to believe that one can leverage the internet to disrupt a well-established industry, which has functioned in a certain way for decades. The life of Apple founder Steve Jobs inspires me to believe that you can disrupt even a mature industry like mobile phones by elevating user experience. First-generation entrepreneurs like Elon Musk of Tesla and Jack Ma of Alibaba inspire me to look beyond the obvious and go for something that is absolutely out-of-box. I still get inspired by the superheroes who do things that look seemingly impossible. To me, getting inspired is a function of an individual’s desire and willingness to challenge the status quo to make the difference. Well, I do not consider myself as influential though I’ve been named among the top 200 fintech influencers in Asia. But I enjoy speaking on International Money Transfers – how to make them more quick, efficient and safe for individuals as well as SMEs/Corporates – and networking with people who share my vision on cross-border money transfers. Of late, I’ve been visiting multiple geographies, speaking at various industry forums and events – making a case for hassle-free and efficient cross-border money transfers. I will be happy to be able to positively influence the money transfer industry in any way possible. Despite their significance, remittances are still not very efficient due to expensive physical agent networks and legacy infrastructure. As much as 90% of the US$ 600+ bn of global remittances are still affected via inefficient and expensive traditional methods. While Fintech has been radically transforming the way financial services are delivered and consumed globally, we have barely scratched the surface when it comes to cross-border money transfers. People are still clinging to traditional methods of international money transfer. With growing awareness and internet penetration, digital non-banking money transfer service providers will take even larger share of the remittance market. The traditional players will be forced to embrace “digital” cost-efficient processes, and even collaborate with innovative fintech players to stay competitive in the next 12 months and beyond. I would like to associate with the brand on Product Development as I have spent significant amount of my time on that aspect. Another activity that I can engage in are speaking opportunities. Just drop me a line on LinkedIn. I will certainly revert if I feel we share similar vision and values.